Download the InterContinental Railway Project Summary (4 pp. PDF, 922 KB) and read it offline. Feel free to distribute it widely. Download the InterContinental Railway Keynote (18 slides, PDF, 11.9 MB) and view it offline. Feel free to distribute it widely. 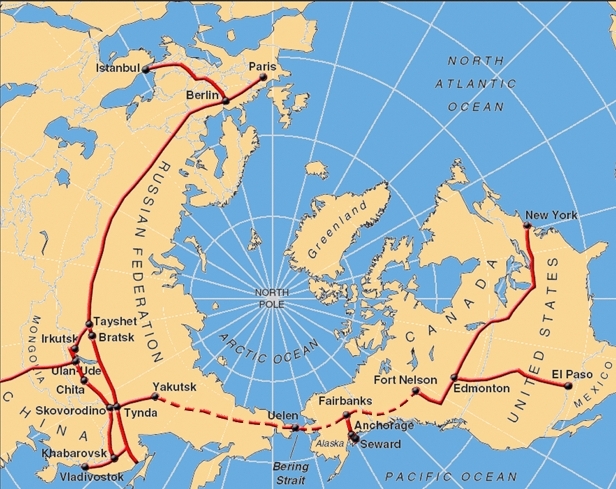 The InterContinental Railway (ICR) involves the design, engineering and construction of nearly 5,500 miles of new railroad, connecting existing railroad networks from Yakutsk in Eastern Russia, across the Bering Strait and Alaska to Fort Nelson, Canada to create a continuous rail transportation link between North America, Russia, Asia and Europe. Although the entire railway is below the Arctic Circle, the project will require the construction of the longest railway tunnel in the world - a 70 mile long tunnel more than 160 feet deep under the Bering Strait. Dual gauge tracks or wheel gauge changing technology would be required for train operation across Eastern Russia. The InterContinental Railway is projected to carry at least 100 Million Gross Tons (MGT) annually of double stack container unit trains, coal, grain, oil unit trains and automobile shipments for foreign trade between the United States, Canada, Russia, China, Japan and Europe. Shipping via ICR trains will take less than half the time of ocean shipping and avoids expensive and time consuming cargo transfers and the delays of ships waiting for berths at seaports. A proposed Trans Korean Main Line would also provide direct service to North and South Korea. The total cost of the $100+ billion dollar project would be financed by access to resource development rights along the route, waybill fees for shipments, government incentives and low interest government loans. North America: Fort Nelson, Canada (existing rail network terminal) to Fairbanks and Wales, Alaska - 2000 kilometres (1243 miles). 130 km (80 miles) are currently under construction as part of the Alaska Railroad’s Northern Rail Extension Project. Electrification through the Bering Strait tunnels and over most of the route would be powered by numerous hydro-electric sources along the route. Over 112 km (70 miles) of spoils from construction of the dual Bering Strait Tunnels will provide significant amounts of fill for the grading of the railroad in Russia and North America.